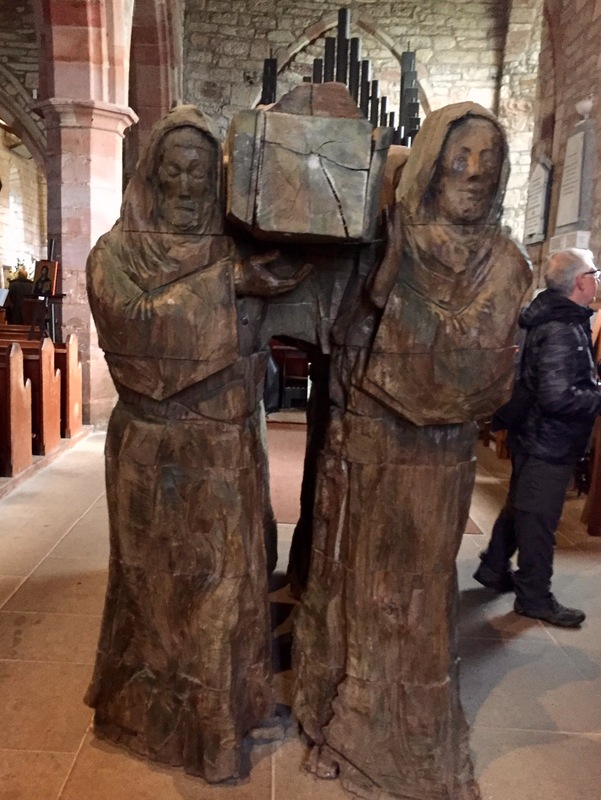 is another sculpture by Fenwick Lawson, using 35 pieces of elm wood, and depicting six monks of Lindisfarne carrying Cuthbert’s coffin from Lindisfarne in 698 to its final resting place in Durham c 920. Long story… This sculpture is in St. Mary’s Church (Anglican), built on the site where Aidan’s wooden church had first stood. A bronze copy is in Millenium Square in Durham – the journey completed. 15 Sep	This entry was published on September 15, 2017 at 4:50 am and is filed under Uncategorized. Bookmark the permalink. Follow any comments here with the RSS feed for this post.